Happy Monday everyone! 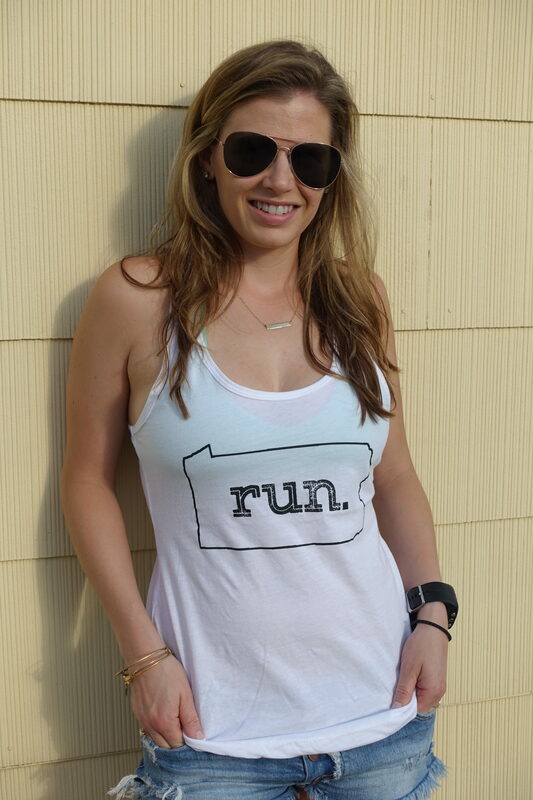 Hope all your running/fitness has been going awesome! It’s quite the rainy Monday here in Maryland. When I woke up this morning and heard the pouring down rain, my immediate thought was to take my run inside on the treadmill. After a few minutes, I changed my mind and decided to challenge myself today by putting myself in an uncomfortable situation (running in the rain) and working on getting comfortable with being uncomfortable. As humans, we tend to HATE anything remotely uncomfortable and stay in our comfort zone. But adventure and the feeling of truly being alive happens outside of our comfort zone. Running in the rain is uncomfortable, but it is fun if you do it right! 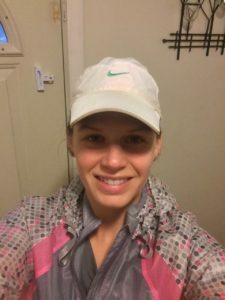 Here are my tips on how to run in the rain and love it! 3. Place your after run essentials, like a towel and newspaper, by the door that you’ll enter through after your run. That way you are not walking through the house soaking wet to get everything you need. 4. Put on anti-chafing ointment prior to putting on your gear. You will get wet. There is no getting around that. Before putting on your shoes/socks, put anti-chafing ointment all over your feet to avoid blisters. Also, put the ointment anywhere clothes or skin may rub like under sports bra straps or in-between your thighs. 5. Now put on your gear. You will need a baseball hat or visor to keep the pouring rain out of your face so you can breathe comfortably. If you wear an armband for your phone, put it on prior to putting on your rain jacket. This adds an extra layer of protection and will prevent your phone from getting wet. 6. Watch your footing! But be sure to jump in those puddles. It’s like being a kid again! 🙂 But those paint lines on the roads can be slippery when wet, so be sure to tread slowly over them or skip over them if possible. Also look out for those leaves! They can be slippery too. 7. Hang dry all your gear on a drying rack. Take care of your gear and it will take care of you! 8. Stuff your shoes with newspaper. Yes I know that sounds odd but you need to dry your shoes ASAP. 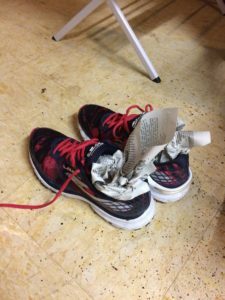 Newspaper absorbs all the moisture from your shoes and is cheap. Do not put your shoes in the dryer! The heat breaks down the material in the sole and changes the shape/structure of the other materials. What other weather elements have you run in? Snow? Heat? Happy April everyone! Running season is upon us and it’s the time of year where I receive the most questions. So in the spirit of the season, this month I am going back to basics with (the appropriately named) Back to Basics Series. Yay!! Do I need to consume fuel during my run? 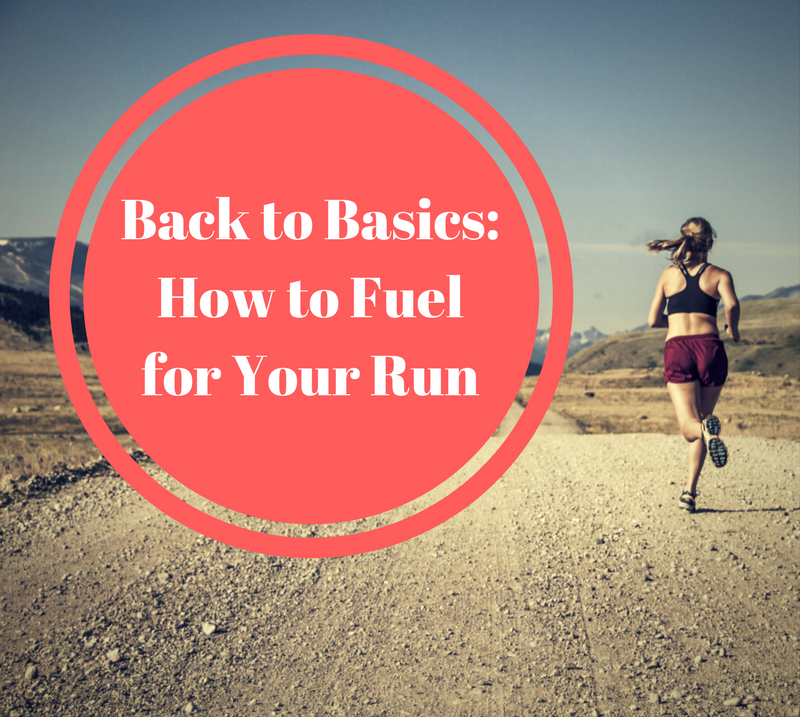 It’s important to know that fuel is only necessary for runs longer than 60 minutes, regardless of the distance. Doesn’t matter if it’s 3 miles or 7 miles, after 60 minutes your body needs carbs. How often should I take in fuel during my run? The ideal rule is 1 package every 45 minutes. So if you plan to run over an hour, start at minute 45, then another an an hour and 30 minutes and so on. If your stomach is feeling “off” or you feel full, don’t feel like it is mandatory to take something. Listen to your body. Which kind of fuel should I consume? Beer! Kidding. Don’t do that. I did that once during a race. I immediately regretted that decision. The most popular fuel is gel. They come in a variety of flavors and are easy to carry with you. Next are chews, which are pretty much like gummies. They are a nice way to switch it up if you get tired of eating gel and want something to chew, hence the name. Next up, sport beans!! Basically jelly beans you feel less guilty about eating. Sport beans are a favorite of mine around mile 17 of the marathon when you are losing your mind and all you can do is count beans…yeahhhh. Frankly, none are greater than the either. Experiment and see which one works/tastes best for you! Disclaimer: If you are ill, please consult your doctor for medical advice. I am not a doctor and I am writing from my own experience and research. Runners are creatures of habit. We LOVE routines. This mostly works in our favor (determination, consistency, etc. ), but there are situations when it can be our worst enemy. Running while sick can fall into that category. Yesterday I had a very minor surgery where the doctors removed some cysts from my head. Fun times right? Like any seasoned runner, the first thing I asked the doctor post-OP was if I could run the following day. I imagine the doctor doesn’t hear that question very often. He advised me to see how I felt and go from there. Sounds reasonable right? But how do you determine the difference between an excuse or a legit concern? 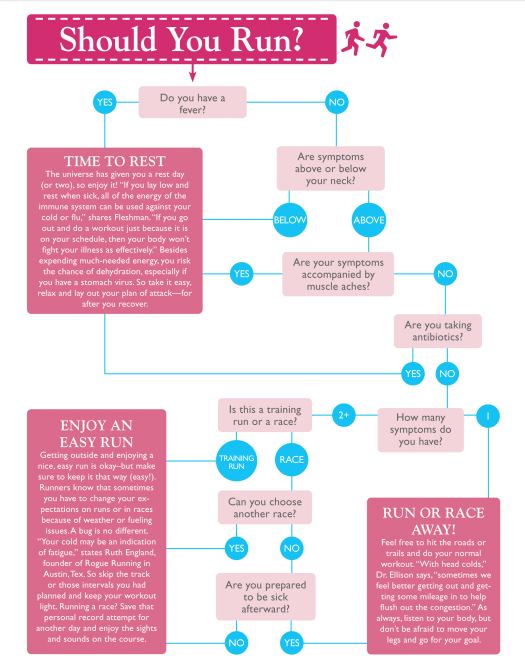 Women’s Running posted an article in 2013 with a handy dandy flow chart that makes it easy to figure out if you should run or not. I always ask my clients this, “does the illness pass the neck test?” If you are congested and that’s really it, go for a run! It can actually help clear you out and temporarily alleviate the discomfort. On the other hand, if you have been vomiting, have stomach issues, and/or muscle fatigue, skip it. 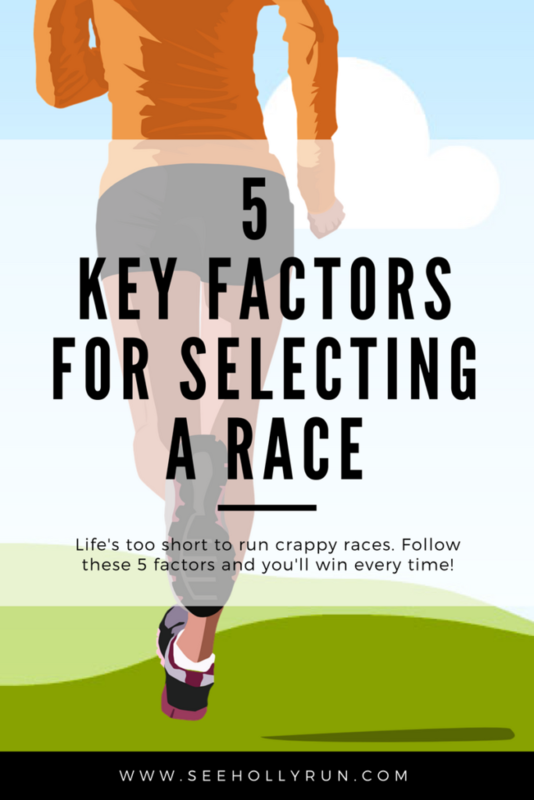 Running while experiencing these issues could only make matters worse. -Read an inspirational book. Two of my all time favorites are Born to Run by Christopher McDougall and Eat and Run: My Unlikely Journey to Ultramarathon Greatness by Scott Jurek. -Watch a movie about sports. I have to say, Rocky gets me every time. Take the rest day and give your body a chance to do its job. You’ll be back at it soon enough.